Longhope Lifeboat Museum Trustee’s Angus Heddle, Karen Kirkpatrick, Kevin Kirkpatrick, and George Taylor are pictured receiving the £10,000 donation from Richard Darbyshire, Regional Production Manager for Scottish Sea Farms’ Orkney. 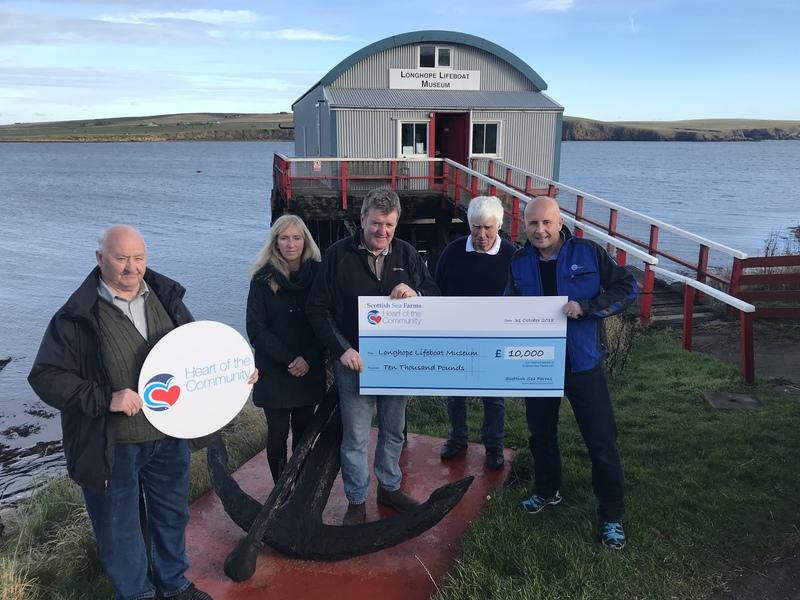 Longhope Lifeboat Museum Trust has received a £10,000 donation from Scottish Sea Farms, which when combined with numerous donations from the Orkney community and beyond, has resulted in the total raised smash through the initial £30,000 fundraising target originally set by the trust. Kevin Kirkpatrick, chairman of the Longhope Lifeboat Museum Trust said that the organisation was “absolutely gobsmacked and incredibly grateful” at a £10,000 donation from Scottish Sea Farms, and thanked the company very much for the generosity and kindness shown to them. He said that since the appeal – backed by The Orcadian – began a little over a month ago, the trust had received widespread support from local companies and individuals from Orkney and beyond, who have sent in donations online and by post, for which the trust was hugely thankful and grateful. “We had hoped to possibly reach our £30,000 target by the end of the year, but thanks to this huge boost from Scottish Sea Farms, and all others who have donated, we are now in a position to get the work underway much earlier than we had hoped, to make the museum both safe and presentable in time for the 50th anniversary of the disaster on March 17 next year,” Mr Kirkpatrick added. He explained that this incredible support has seen the total raised reaching £33,576.20. This total is worth even more when the GiftAid benefits have been calculated from applicable donations at the end of the appeal. GiftAid is a scheme enabling registered charities to reclaim tax on a donation made by a UK taxpayer, effectively increasing the amount of the donation. Reaching this total will now allow what the trust is calling phase one of the restoration project get underway at the former lifeboat station, with phase two planned for the future. 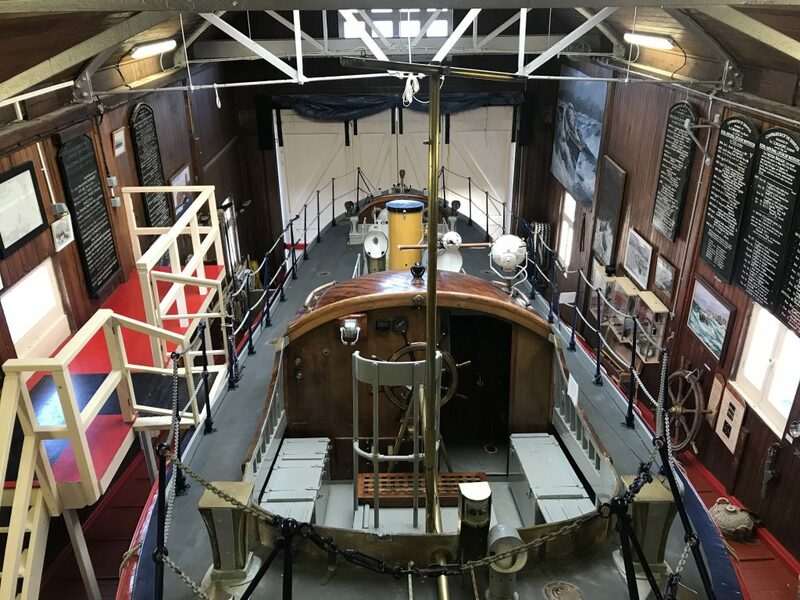 “As originally planned, we will keep the appeal running until in end of the year, and any further money we receive will go directly towards further improvements and restoration work at the museum, which was built in 1906, and houses not only numerous artefacts, but also the only slipway launched vintage lifeboat in the country,” Mr Kirkpatrick further explained. He said that the fantastic level of support shown to the trust would, he hoped, stand the organisation in good stead when it comes to applying for funding for future conservation and restoration work at the building. Richard Darbyshire, regional production manager for Scottish Sea Farms’ Orkney said: “Anyone of any age living on Orkney will have heard of, or will grow up to hear of, the Longhope Lifeboat disaster. Nearly 50 years on, it still has the capacity to send chills down the spines of those who either work at sea or whose loved ones work at sea, and rightly so. Georgie Mackenzie, Heart of the Community co-ordinator at Scottish Sea Farms said: “Founded, funded and staffed purely by donations and local volunteers, Longhope Lifeboat Museum is a truly touching example of what can be achieved by community spirit – as is the amount of money raised in such a short amount of time to help fund the essential work and improvements needed.